Even as wild advances in science expand our understanding of the human mind, blind spots remain. 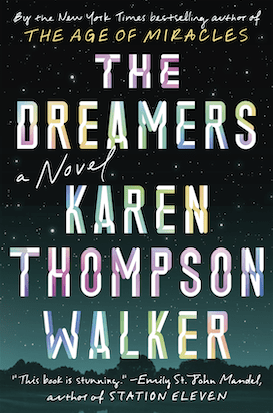 One of those spots is dreams, which are at the heart of Karen Thompson Walker’s new novel. The Dreamers opens in Santa Lora, a college town in California, where an unexplainable sickness begins appearing on a specific floor of a dormitory before spreading to the population at large. The sickness leaves victims in a deep sleep, from which they cannot be woken for days, weeks or months. It’s highly contagious, and some patients die when their heartbeats dip to an unsustainable low. But scientists brought in to study the virus report high brain activity; it charts as higher than when a person is awake, suggesting highly vivid and intense dreaming. That fact is underlined when patients begin to wake up, confused because their dreams were so real that they struggle to draw distinctions between fantasy and reality—or between past, present and future. Walker’s prose is hauntingly beautiful, jumping into the future to put Santa Lora’s experiences into a larger perspective. She tells the story of this town through a few residents; two young parents who have moved to California in part to leave behind their marital problems, the daughters of a doomsday prepper father, a professor grappling with the decline of his partner, a college girl who was roommates with the first patient and who is in an ambiguous relationship of sorts with another survivor from the dorm floor where the virus emerged. Others, like a psychiatrist who has left her daughter in L.A. to come to Santa Lora, flit in and out of focus with less frequency. The tropes that define these characters are transparent and predictable at times, and most react as expected to the threat of virus. The prepper boards up his windows and bars his children from leaving the house, the young parents fight as they become consumed by worry for their daughter. A boy who has been withholding affection suddenly, when faced with loss, apologizes. But the easily recognized characters are not a deficit, even if that predictability feels at odds with the unique plot. Walker keeps the focus on the virus itself and the anxiety it engenders among residents of Santa Lora. She taps into a primal fear of the unknown, as doctors and experts struggle to understand what is happening to their patients. That Walker leaves unanswered questions about the virus doesn’t feel like a cop-out. Instead, it feels like an extension of the dilemma facing those who wake up, struggling to determine where their dreams end and life begins. The Dreamers could have read as cruel; the town is cut off by a quarantine, and the military is called in to guard the only road in and out. These are not events that bring out the best in people. But rather than explore a darker thought experiment about the nature of people in panic, Walker highlights the subtle ways in which those who are trapped begin to aid one another. There are no heroes who perform superhuman feats of generosity, but there are young people who help rescue workers check houses for bodies, or little girls who take in pets they find wandering the streets. What could have been a bleak story is, instead, a powerful examination of people doing their best to hold things together under extreme circumstances.